Floods and droughts in farm country do billions of dollars in damage every year. Farmers can reduce that damage by building healthier soils. Floods and droughts are an increasingly costly problem for farmers, ranchers, taxpayers, and downstream communities. But farmers can fight back by adopting practices that build healthier, more sponge-like soils. And smart policies can help them do it. That's the conclusion of a 2017 UCS report, Turning Soils into Sponges. 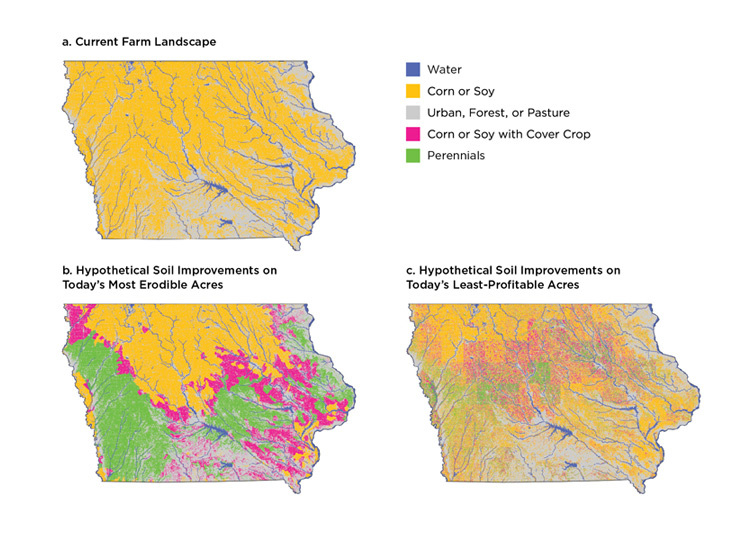 The report draws on experiments from across the world to quantify the benefits of soil-improving agricultural practices, and then predicts the results of applying these practices on a large scale across the state of Iowa. And there’s good news: building healthier soils could reduce runoff in flood years by nearly one-fifth, cut flood frequency by the same amount, and make as much as 16 percent more water available for crops to use during dry periods. 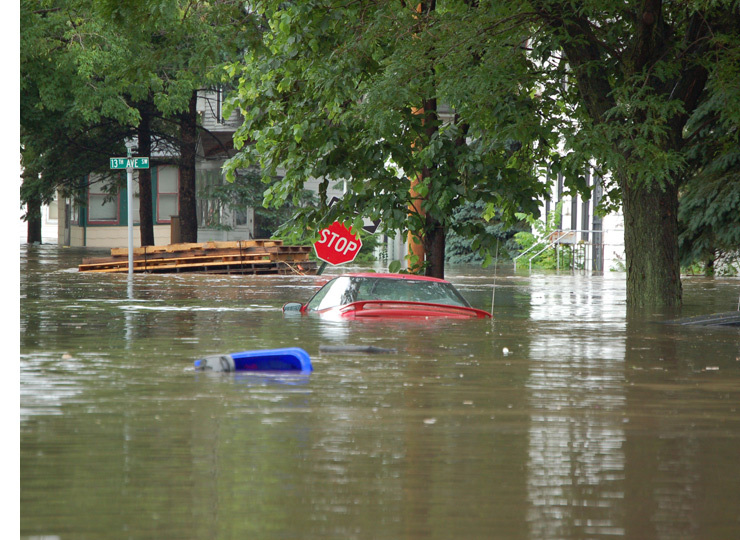 In the United States, floods and droughts together have done damage worth an estimated $340.4 billion since 1980. And farmers and ranchers are among the most affected, as floods and droughts devastate livestock, crops, and soil. Taxpayers share in the burden through subsidized federal crop insurance programs. Insurance payouts due to floods or droughts totaled $38.5 billion between 2011 and 2016—and that bill is expected to keep rising as climate change brings more extreme weather. The impacts of these disasters aren't confined to farmers or the taxpayers who insure them. Communities located downstream from farming regions feel the effects as well, as floods damage homes, businesses, and infrastructure. Farmers can't make it rain—or make it stop. But they can do things to make their land less vulnerable to the effects of extreme weather. Over the past several decades, agriculture has moved increasingly toward systems dominated by a few annual crops—typically corn and soybeans—often with fields left bare between growing seasons. This trend has degraded soil structure, leaving it less like a sponge and more like concrete, which exacerbates the damage done by floods and droughts. To combat these impacts, farmers have tried options such as investing in irrigation equipment or drainage systems. But these aren't always long-term solutions, and they can have damaging effects of their own. There's a better way: get to the root of the problem by building healthier soils with a sponge-like ability to hold water. Several farming practices have been linked to improved soil health, and they share one thing in common: they keep plants with living roots in the soil year-round. 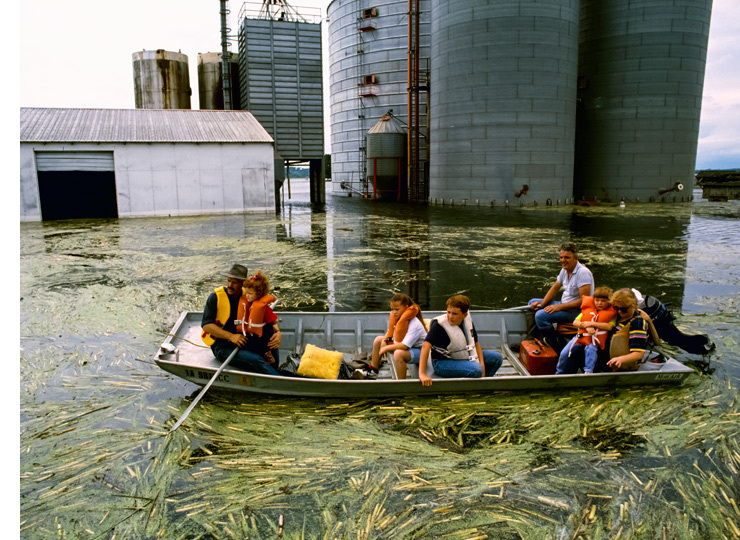 An Iowa farming family surveys damage to their corn crop following a flood event in 2012. Flood- and drought-related damage in farm regions costs billions of dollars every year—and much of this cost is shouldered by taxpayers in the form of crop insurance payouts. Cedar Rapids, Iowa, June 2008. Flooded farmland doesn't hurt only farmers—downstream communities face damage to homes, businesses, and infrastructure. 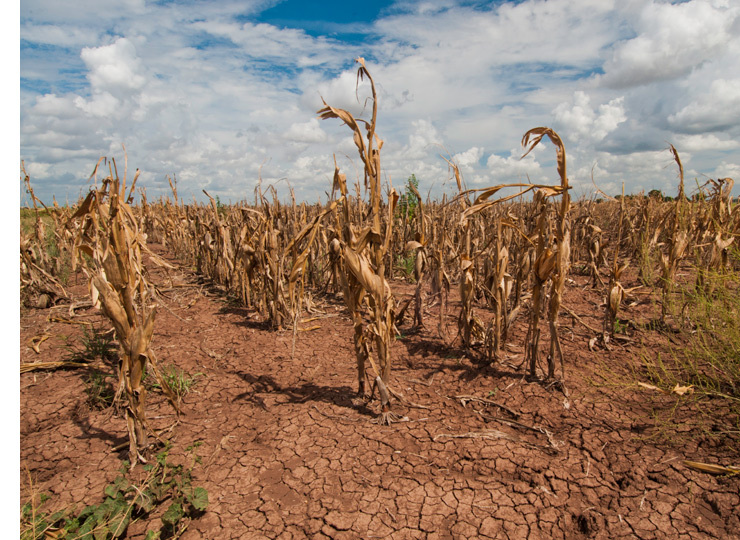 Too little water can be just as devastating as too much—and soils degraded by years of corn and soybean monocropping are especially vulnerable to the worst effects of both. Climate change is expected to raise temperatures and increase rainfall in Iowa over the remainder of the 21st century, making the state's farmland even more susceptible to damage from extreme weather. Experiments conducted around the world show how diversifying agricultural practices—particularly a shift to using more continuous living cover—can greatly increase the amount of water that enters the soil and becomes available to crops. 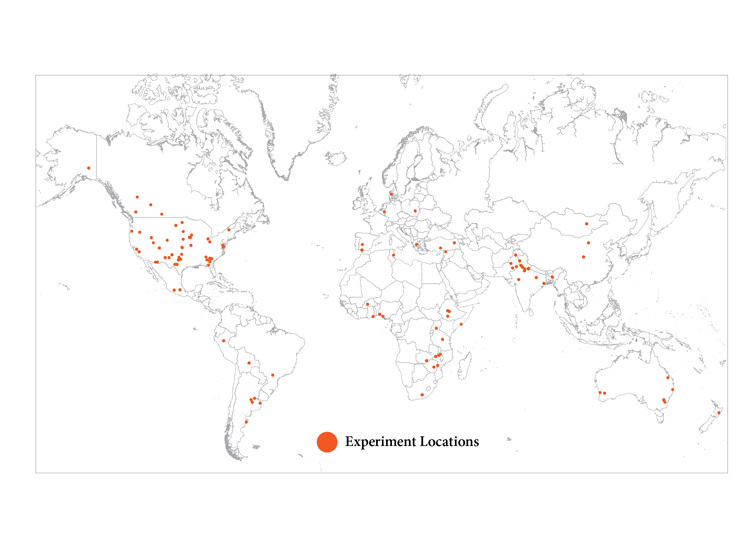 Our meta-analysis of infiltration rates included 126 experiments on six continents. By implementing practices that keep living roots in the soil year-round, farmers can become part of the solution to flood and drought damage. 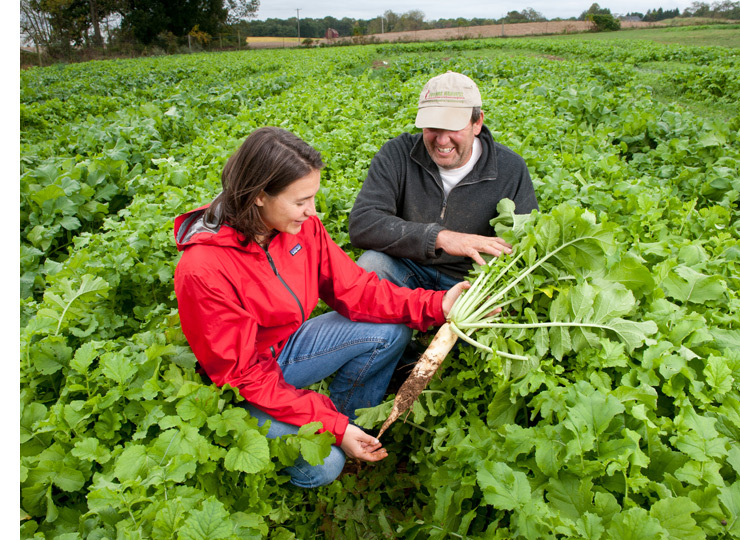 Here, soil scientist Natalie Lounsbury and farmer Jack Gurley inspect a tillage radish cover crop as part of a project funded by the Sustainable Agriculture Research & Education Program. This plant's roots penetrate soil deeply, reducing compaction and increasing water infiltration, which makes it an excellent cover crop to improve soil structure. 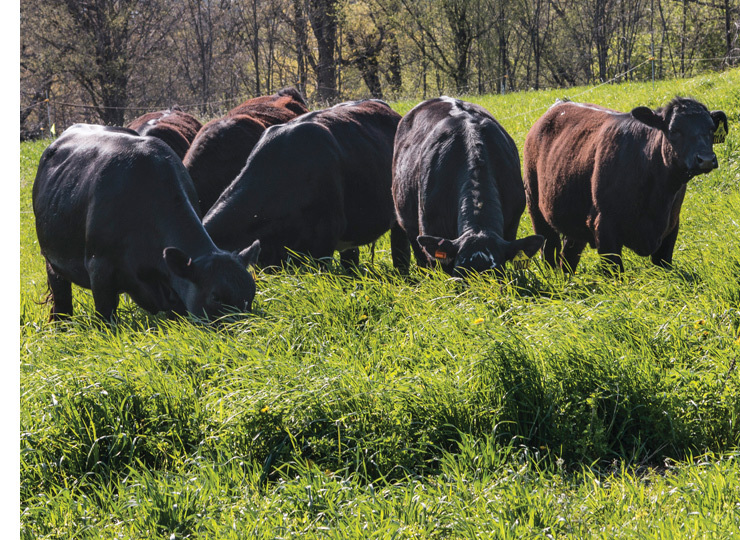 Cattle graze on kernza, a multipurpose perennial crop, in a research trial at the University of Wisconsin-Madison. A perennial cousin of wheat, kernza may be grazed by livestock in the spring, harvested for grain in the summer, and then grazed again in the fall. This deep-rooted plant grows year-round, protecting soil and increasing water infiltration. Today's Midwest annual cropping system experiences significant water loss through runoff and evaporations from bare soil (left graphic). 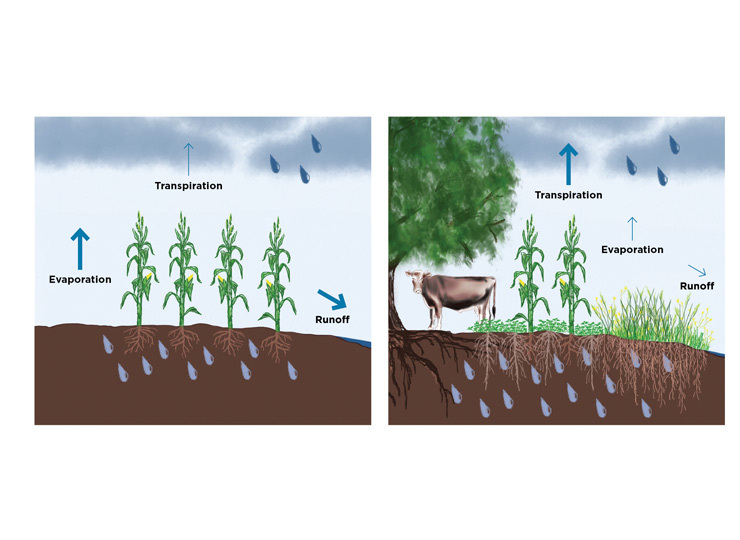 Incorporating perennial crops or grasses, cover crops, trees, and grazing animals increases water retention in soil, improving efficiency (right graphic). Note: Arrows represent the relative extent of transpiration (crop water use), evaporation, and runoff in the two systems. Below-ground raindrops represent the water-storing capacity of the soil in each system. The first bar shows the overall percentage of experimental alternatives that were able to increase the absorption of rainfall by more than one inch. The other bars show the percentage of experiments within each category that improved absorption of rainfall by the same amount. Our analysis of experiments involving various soil management practices produced ranges of the rate of water entering and moving through soil. 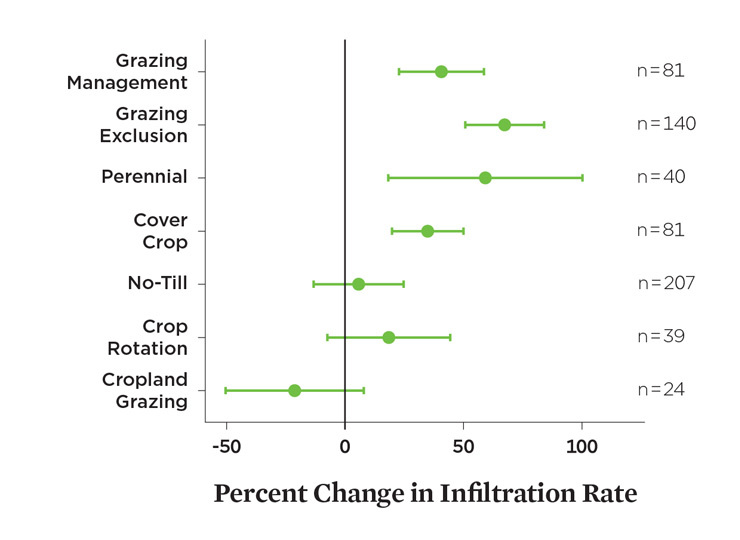 As this figure shows, the greatest increases resulted from continuous living cover practices and changes to graizing management. Estimated ranges show average changes from conventional practices. The "n" numbers show the number of experiments included in each category. 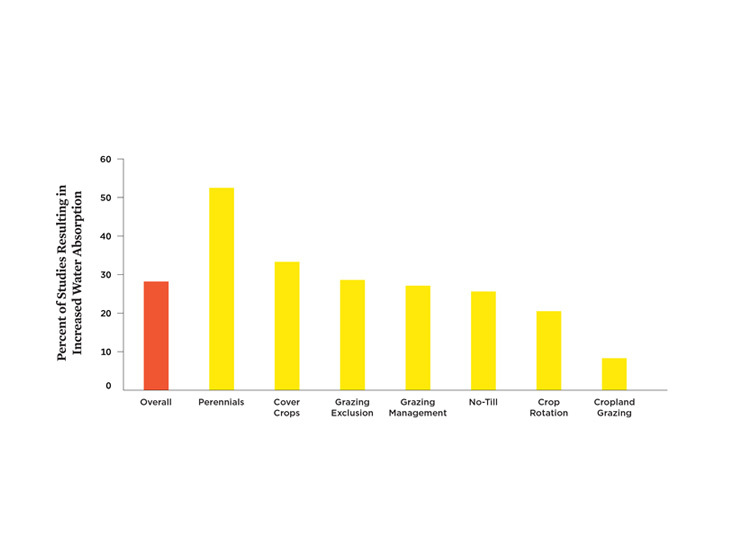 At top left is the current farm landscape in Iowa, in which most cropland is planted with corn or soy. The maps at bottom left and right show what the state would look like if approximately one third of corn and soy acres were shifted to improved soil-building systems featuring cover crops (pink) or perennial crops (green). The map at bottom left depicts such a shift on today's most erodible acres; at bottom right, on the least profitable acres. Incorporating more than 150 field-scale experiments from six different continents, the analysis evaluates the impact of specific practices on soil properties such as the rate at which water moves into and through soil (infiltration rate), the spaces between soil particles (pore space or “porosity”), and the amount of water made available to plants. The authors identify "continuous living cover," which can be achieved through incorporating deep-rooted perennials, cover crops, consistently and effectively improving soil health. The report then then shows how flood and drought outcomes could improve if continuous living cover practices were adopted on a large scale in a representative Midwestern farm state—in this case, Iowa—starting with regions of the state that are already the least productive and most at risk of erosion. Keeping soil unplowed and covered with living plants increased its ability to absorb water in 70 percent of the field studies analyzed. 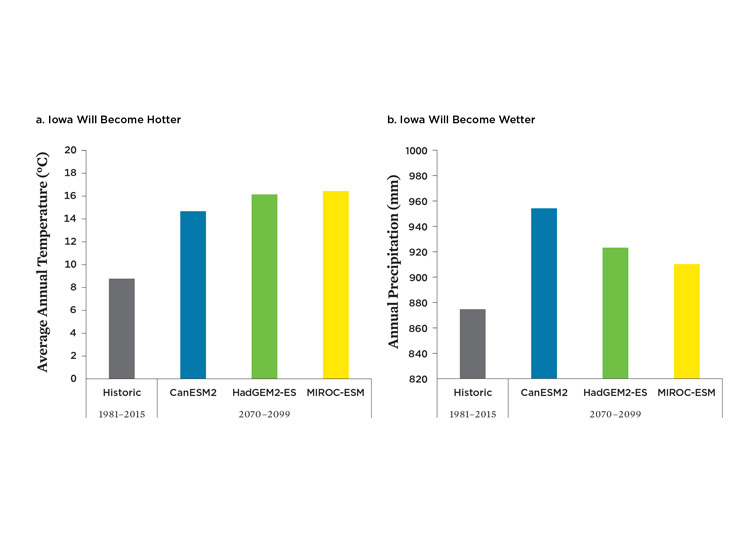 Water infiltration rates improved by 59 percent with perennial crops, 35 percent with cover crops, and 58 percent with improved grazing practices. Converting approximately one-third of Iowa’s cropland—today’s least-profitable and most-erodible acres—to perennial crops, or to corn or soybeans grown with a winter cover crop, would result in significant water savings. It would have reduced water runoff in recent extreme weather events by up to 20 percent and flood frequency by the same amount. During devastating droughts in 1988 and 2012—each of which caused more than $30 billion in damage—adoption of soil-improving practices would have made as much as 16 percent more water available for crops to use. The practices highlighted in the report could bring significant benefits to farmers, taxpayers, and surrounding communities. But there are also significant barriers to their adoption, including up-front costs and the need for training and technical assistance. More research is also needed to help farmers optimize soil-improving practices for the specific crops, soils, and weather conditions they work with. Expand incentives and strengthen up-front financial support for farmers to help them adopt soil management practices that deliver flood and drought resilience. This includes strengthening support for good soil management practices in the federal Conservation Stewardship Program, facilitating state and regional solutions through the Regional Conservation Partnership Program, and encouraging collaborative solutions through the Environmental Quality Incentives Program. Provide incentives in the federal crop insurance program to reduce flood and drought risks up-front through good soil management. This includes incorporating soil quality and management metrics into insurance premium calculations, improving enforcement of minimum conservation requirements for policy holders, incorporating ecological principles, and encouraging diversified farms by promoting whole farm insurance policies rather than insuring one crop at a time. Invest in research to optimize the benefits of incorporating perennials and other soil management practices into a wide variety of agricultural landscapes.